What is borax? It is a natural occurring mineral (a compound of the element, Boron). Borax has lots of practical uses (some listed below) and is often purposed as an affordable, natural cleaning, odor eliminating, eco-friendly cleaner used around the home. Where does borax come from? One of the largest deposits is located in Boron, California, home to the U.S. Borax Boron Mine, the largest borax mine in the world. 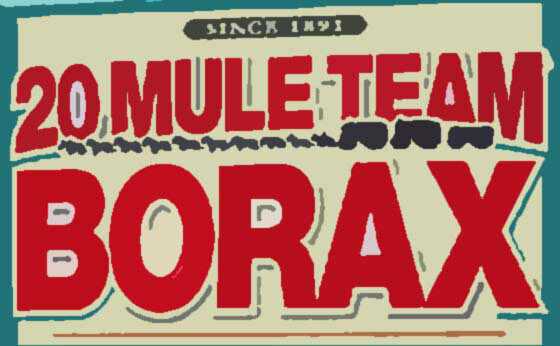 Borax is used in a variety of laundry and cleaning products, perhaps most famously the “20 Mule Team Borax” laundry booster. Today there are lots and lots of cleaners and brands to choose from and many of these cleaners are marketed towards specific cleanup purposes with their unique ‘special’ formulas. Here’s the thing… More profits are made if they convince you that you need these special cleaners – “re-formulated”, “improved”, or “advanced”, etc.. The brands are constantly reinventing themselves and offering more choices and formulations, however somehow you keep paying more and more. I believe that borax is an excellent “prepper staple”. I have been printing out lists of non-standard uses for everyday items. If the time comes that I can’t get bug killer, glass cleaner, or whatever, I will be able to look for an alternate product. So I have lists of alternate uses for salt, vinegar, WD-40, etc. Many came from this site. I have also printed out instructions for all sorts of things I would normally have someone else do, such as turning off my gas, water, etc. and draining all my indoor pipes. I have copies on my computer, too, but I assume that in a real emergency, there might not be electricity to turn on my computer. Thus, lots and lots of printouts. Actually, vinegar is supposed to be good for windows. Like I said, I have lots and lots of printed lists for lots and lots of different products. But my windows probably won’t get washed in a SHTF situation. I can’t reach them from outside without a ladder and I wouldn’t want to risk falling with the hospitals shut down. Also, all my windows have storms, and I wouldn’t be able to take them off by myself. (They are all double pane, so I’m not sure why they have storms, too.) Anyway, when the SHTF we will all want dirty windows so nobody can see inside. Borax is not just for SHTF – it’s for everyday life. I use it fairly often when needing some extra strength cleaning power. Regarding windows, I have only used borax in solution for extra dirty windows. Sometimes window screen residue builds up on the glass and borax will help get it off. It does leave streaks if not rinsed well afterwards. Be sure that the granules are dissolved in water (use hot water) to help ensure that you don’t actually scratch the glass (if you rub it hard). Once every 5 years whether they need it or not! Hummm, I wonder if Borax mix will keep fungus off of Tomatoes and Potatoes. Anybody know?? Fungus is a real issue in NH. I don’t know, but after I read that, I put some on all the mushrooms that are growing in my yard. We have had an unusually wet spring. The mushrooms still seem to be ok, but I tried some on some weeds, too, and they seem to be turning yellow. I looked up borax and it has a ph of 9.3. Most plants thrive in ph 6-7. Some such as plants in the nightshade family do well if the soil is as acidic as 5.2. So I can see why borax might kill weeds (and other plants.) Notice that the recommendation is for weeds growing between cracks in the sidewalk. You wouldn’t want to put it on your whole lawn. Hydrogen peroxide is solution for garden according to articles..I have seen. Just do search on peroxide in the garden…2 different ways to use it .. one for soil and one for plants. Bottom line, since Borax has a ph of 9.3 and nightshade vegetables such as tomatoes, potatoes and peppers need a ph of 5.2 to 5.6 I don’t think you should try it. I used Borax for preserving the fish skins, heads, and fins for mounting when I had a fishidermy on Toledo Bend lake. It worked wonders and gave me a “fishy” business. It works on small furry and feathery critter hides as well. Really handy stuff. I sometimes throw a spoonfull into the collection buckets of my dehumidifiers to combat the funky stuff that likes to set up housekeeping there. The reason Borax is used to kill weeds between patio stones is that when the soil or dirt is overloaded with boron nothing will grow. I have tried mixing it with water and pouring it on. I have also tried just pouring the straight Borax (dry). So far I haven’t had it kill the weeds. I intend to try different amounts. I also make my own laundry detergent of borax, washing soda, baking soda and purex crystals and fels naptha, zone or sunlight soap. Quite the money saver. I just use Arm & Hammer, Borax, and Fels Naptha. Nothing else. Amazing List Thank You. I honestly had no idea of all the uses. Regarding laundry detergent, one of the main stain removal and whitening agents is phosphate, but in their great wisdom the EPA mandated phosphates be left out of detergents several years ago. Phosphate cuts oil and grease, which is why t-shirts and work clothes don’t come as clean as they used to. Now, I’d never do this, the EPA wouldn’t like it, but I’ve heard that adding a quarter cup of TSP to your laundry will bring back the cleaning we used to expect. I’ve heard, of course I’d never buy it, that you can get TSP (tri-sodium phosphate) in most any paint department. They sell it to painters for cleaning oily film (smoking) off walls before painting. People tell me that if I were to use it for cleaning walls or floors, follow the instructions as to protective gloves and eyewear. I do a lot of Brewing, there is a compound called PBW (Powdered Brewers Wash) that is used for cleaning up everything including the stuff that gets burnt on to cook-pots, Someone did a MSDS sheet analyses and came up whet the following mix from the chemicals found in BPW; 30-40% TSP (tri-sodium phosphate) and 60-70% OXY-Clean Free (the stuff with no added perfumes). This stuff works like crazy, I add 1/2 cup to a 15 gallon brew-cook-pot let it sit for a couple of hours and it’s supper clean. And at about 1/10 the price of PBW. TSP, wonderful stuff, the only thing that works well to clean up a veg oil mess. If you venture in to using veg oil sooner or later you will have a mess to clean up, remember TSP. Borax makes laundry smell clean and nice. Cockroaches don’t like it either! I put around 20 boxes in my 22,000 gallon swimming pool to lock in the PH and the water felt really soft afterwards. I use 20 mule team borax during the salmon season to cure salmon eggs for salmon and trout bait. I was thinking about using Borax on my carpet to freshen it up. Is Borax safe around pets? Using the recipe on my tub and toilet today. No, Borax is used as an ant killer. I don’t know if it would kill cats and dogs, but it sure makes them sick! Won’t use it for that. Trying out the tub use. I’m reading elsewhere that borax is safe to use internally for a variety of applications.